These paleo buttermilk pancakes are like a cross between typical fluffy American pancakes and crepes! They’re also grain-free, gluten-free and dairy-free. You may have seen my recipe for gluten-free pancakes over on My Baking Addiction the other day. The first time I made these, I used regular dairy-containing buttermilk and butter, which is the version I’m sharing over on MBA. Then, me being me, I needed to test them a whole bunch and eventually ran out of buttermilk. So I figured I might as well make these pancakes dairy-free, which also turned them into paleo “buttermilk” pancakes! You really can’t tell any difference between the store-bought buttermilk and homemade dairy-free buttermilk version. The stack you see here is actually a mix of the two. The thickness is kind of different than what you’re probably used to. They’re not thick like regular American fluffy pancakes, but they’re not nearly as thin as crepes. They’re just hanging out in the middle – but they’re still pretty awesome! Especially for people like me who don’t like their pancakes to be too bread-y. I used a mix of blanched almond flour and tapioca flour, which is also called tapioca starch. I’ve been doing a lot of grain-free and nut-free cooking recently and have been using tapioca quite a bit. I thought it’d be slightly strange but I’m enjoying it so far! I got mine from an Asian grocery store for about $1. You can of course use unblanched almond meal if you don’t mind the bits of almond skin in your pancakes. If you’d rather have coconut flour-based pancakes, try these Light and Fluffy Coconut Flour Pancakes from All Day I Dream About Food. They look amazing! 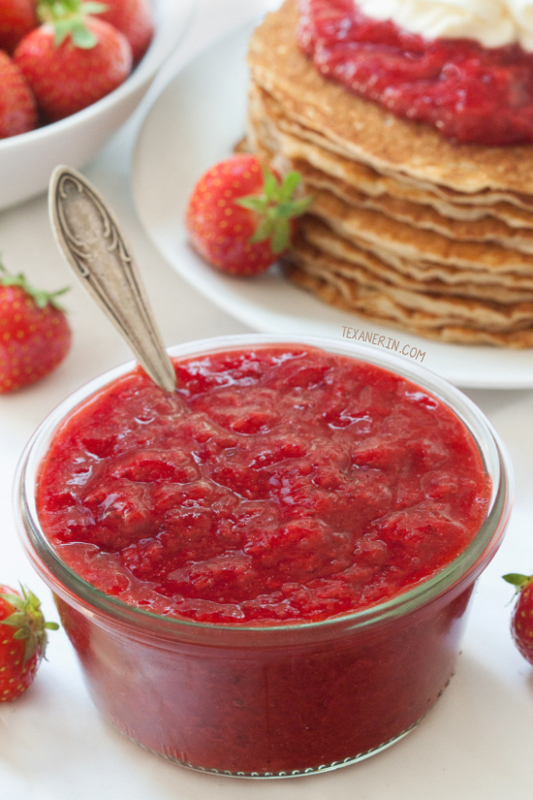 These pancakes are perfect smothered in maple syrup or in this honey sweetened strawberry sauce. I make that sauce every year after coming home from strawberry picking (along with this 2-ingredient strawberry applesauce)! One of winter’s highlights, as sad as that may be, is coming across a long-forgotten bag of this sauce. Seriously. Winters here are ridiculously dreary and a little piece of summer is a cause for celebration! As for the whipped cream topping you see in the pictures – a little goes a long way. Remember to use whipped coconut cream if you want to keep it paleo / dairy-free. And if you’re wondering what to serve this with, I think this hashbrown breakfast casserole would be amazing! If you want something thicker, these paleo blueberry pancakes look perfect! Or don’t need a grain-free version? 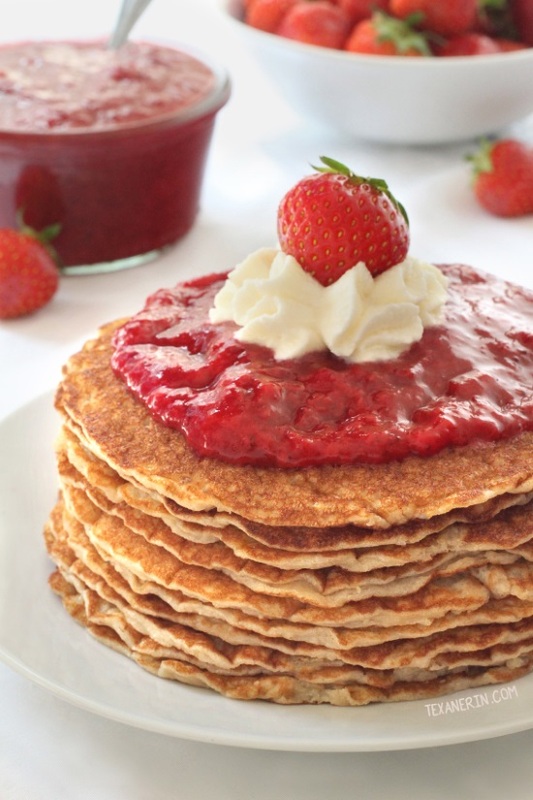 Try these delicious looking gluten-free buttermilk pancakes! If using store-bought dairy-containing buttermilk, skip to Step 2. Otherwise, prepare the dairy-free buttermilk. Add 1 tablespoon lemon juice to a 1-cup (240-milliliter) measuring cup and fill up with dairy-free milk. Add 1 teaspoon lemon juice to a 1/3-cup (80-milliliter) measuring cup and fill up with dairy-free milk. Let sit for 5 minutes while preparing the rest of the recipe. Serve immediately and keep any leftovers refrigerated for up to 4-5 days. Omit if using store-bought buttermilk! 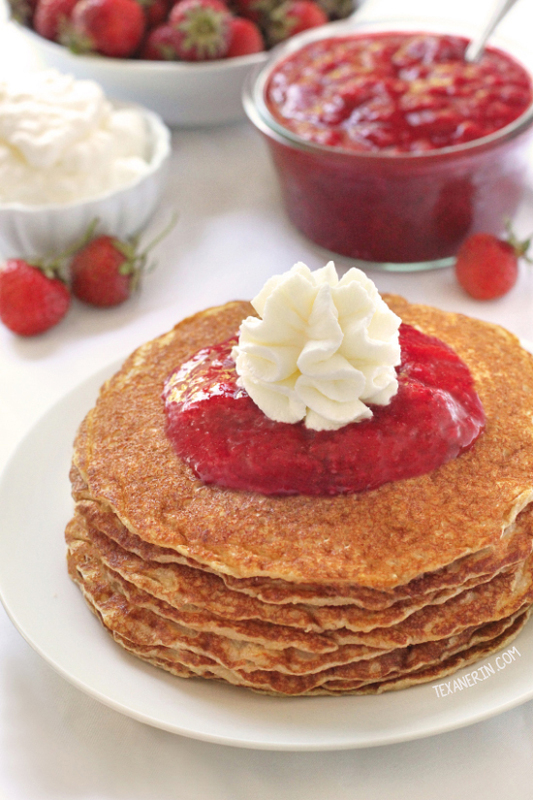 38 comments on “Paleo Buttermilk Pancakes (grain-free, gluten-free, dairy-free)” — Add one! Thank you so much for this yummy recipe! We had tried some almond pancake recipes in the past but did NOT like them. So our go to recipe for the last couple years has been an oatmeal pancake recipe. This morning I was out of oats and had my heart set on pancakes… SO GLAD I found this recipe I had pinned many moons ago! These were delicate and delicious! I didn’t have a full half-cup of tapioca starch so I subbed arrowroot. And I added a few “Enjoy Life” mini chocolate chips to each pancake, and topped with strawberries and maple syrup. YUM!!! That’s great that arrowroot works well! Thanks for the tip. I’m also not a fan of almond flour only pancakes. They usually have such an odd texture. And oh my – chocolate chips, strawberries and maple syrup. That sounds heavenly! Wish I could have joined in. :D Thanks a bunch for your comment! Oh, Erin, you’ve done it again! As I sit here with my belly full of the un-*expletive here*-believable pancakes, I felt the need to comment now. Texanerin is my go to blog for all things grain free and dairy free and these pancakes are just one of the many reasons for that. So far, I have made the Chocolate Chip Cookies, Ginger Cookies, these Pancakes and the Vegan Vanilla Sauce. My husband doesn’t have allergies or any food restrictions and is enjoying all of these goodies as much as I! Thank you for making a huge dietary transition soooo easy! Aww, thank you! What a super nice comment. :) I’m so very happy to hear that you and your husband are both enjoying the recipes and that the dietary transition isn’t going so badly! Good recipes definitely make it less painful. :) Thanks a bunch for your comment and I hope you’ll enjoy the other recipes just as much! I’ve never written a comment on a recipe before, but had to tell you these pancakes are delicious! I used buttermilk and butter, and really couldn’t tell the difference between these and the traditional buttermilk pancakes I’ve made for years. My husband and I are on an anti-inflammatory diet, so we can’t have gluten. I’ve tried so many gluten-free recipes, and our neighborhood deer have ended up eating a lot of the results :). These pancakes are delicious, though, and easy to make. Thanks so much for this great recipe! Haha. That’s so sad (but kind of funny) that the neighborhood deer have ended up eating your other GF experiments. :D I’m happy that you’ve found a recipe that you didn’t have to share with them. :) Thanks for your comment and sorry for just now seeing your comment! I just made these pancakes, and once again, this recipe is great! Every Sunday I make pancakes for my family, but rarely do I eat them. I just don’t need that many carbs. I did make a couple of substitutions for these. I used real buttermilk and butter. I didn’t want to use tapioca flour because that’s all carbs. I substituted coconut flour instead and added another egg. These came out great! They were light and fluffy, although a bit fragile. I made 6 pancakes out of this, so if I make them smaller next time, I’m sure that will take care of the fragility issue. However, they didn’t fall apart, so they weren’t too fragile. They have a slight eggy flavor, but I didn’t really notice it after I put mu sugar free blueberry syrup on them. Overall, success! Now, I’m off to Trader Joe’s to get more almond and coconut flours since I’ve run out due to making your yummy paleo recipes. :) Thanks!! Woohoo! So happy that you liked these, too. :) How much coconut flour did you use? I’m shocked that that sub worked since the two flours aren’t at all interchangeable (I know that’s why you added an extra egg, but still, I would have never imagined that that’d work!). Thanks again for your feedback. I love that you’re enjoying my paleo recipes! I wasn’t sure how the coconut flour sub would work either, but it did! I think next time, I’ll add about 1/4 c more of buttermilk instead of another egg. I do like my pancakes fluffy, so I whipped the liquids with a whisk before I added the dry ingredients. The only setback–I ate 3 pancakes about 6 hours ago, and I still feel very full! (Well, actually, that’s probably a good thing!) I’ll know not to eat that many next time! Haha. Doesn’t sound like a setback to me. ;) At least you didn’t go into a carb coma! That always happens to me with regular pancakes. :D Thanks again for your comment! I’ve tried a lot of different grain free pancake recipes, and I’ve found some decent ones, but OMGoodness, these are AWESOME!!! I tossed all the other recipes, no reason to settle for less than the best. I made the dairy version today. I’ll try the non-dairy version with my homemade cashew milk next time to compare. Thanks for providing me with a pancake I can really look forward to with breakfast! why do you put the lemon juice in this recipe with the dairy free milk? does it curdle it? Beautiful plating! I really love how unique your pancakes are too, not too thick nor thin! I’m all about those stacks and that strawberry sauce! YES. Right?! I love maple syrup but it’s hard to compete with strawberry sauce! As great as the thick pancakes are, they can be filling. I’d rather have more of the thinner type (with crispy edges), so I can fill up on that strawberry topping! These sound so wonderful. I have all the ingredients except the eggs. Think I’ll try them with chia eggs. I bet it will work. Thanks so much! That looks so incredibly decadent and summery. Must make this for the kiddos! I hope they’ll love them as much as we did! I’m with some of the others – I usually prefer a fluffier pancake but these look delicious! I may need to change things up this coming weekend! I hope you’ll enjoy them if you try them! I actually don’t like my pancakes thick and fluffy, so I thin out my batter…therefore, these look perfect to me! Plus, my mom can eat them (and I don’t know how long it’s been since she’s had pancakes)…I’ll definitely be trying these, thanks for the recipe! I do not discriminate against pancakes–I love them all! A good, thin & chewy pancake hits the spot sometimes. The strawberry applesauce on top sounds delightful! I love this recipe…sharing with some of my friends! YUM!! We just went to Augusta,GA this weekend and visited a close friend. Saturday we drove about 30 miles into SC and got 14 boxes of peaches. Not all was for us. HA!! I could chow down some pancakes and peaches too. I love strawberries too. I just made 4 jars of peach preserves today. Having to let them ripen. It is nice to just do a few at a time. I’m normally a fan of super fluffy pancakes, but sometimes I just want to load them up with toppings and a thin one is much better. I’m always trying to diversify my pancakes, so these grain free beauties sound great.